Jack Bell Gallery is pleased to present a solo exhibition of new large scale paintings by Ivorian contemporary artist Armand Boua. The show coincides with a major survey exhibition entitled ‘Pangaea II: New Art From Africa and Latin America’ at Saatchi Gallery, London, featuring works by the artist in depth. 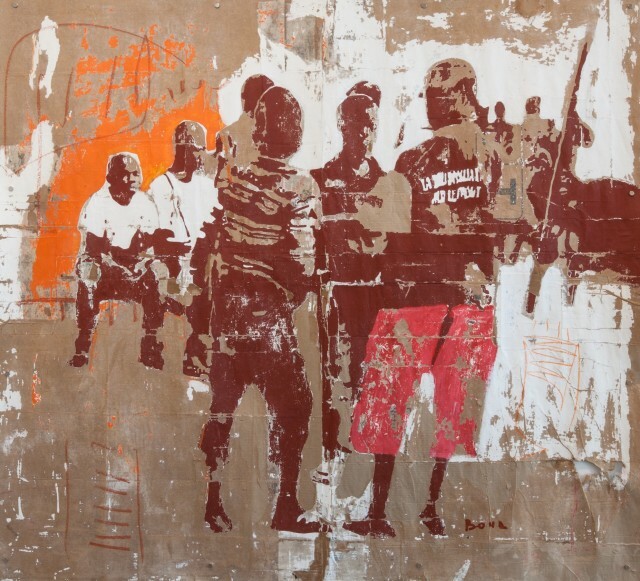 The violence that followed the disputed Ivorian presidential election in late 2010 greatly influenced Boua’s work. As the conflict escalated, many children were separated from their families amidst the political turmoil that enveloped Abidjan, Ivory Coast’s sprawling capital. Drawn to densely populated areas in search of work, the children find themselves vulnerable to exploitation and often excluded from the opportunities they sought after. These children tend to live in slums with poor sanitation, minimal access to safe drinking water and overcrowded schools. Leaving the slums to escape these conditions means facing a worse predicament, enduring life on the street. In his second show with the gallery, Boua takes the street kids of his hometown Abidjan as subjects for a powerful series of portraits. ‘I wanted to show their suffering, their way of life’, he says, ‘so that people are finally aware of this painful reality they pretend not to see’. Boua is noted for his textured and layered compositions, using tar and acrylic on found cardboard boxes. Each layer is applied and then scrubbed and stripped back, leaving abstract forms that come in and out of focus. His use of found materials – recycling the cardboard boxes used as makeshift shelters by street kids – shows a strong engagement with his local environment. Boua achieves a careful balance between his heavy gestures and violent execution and the gentle treatment of his subject matter, both mute and subtle. Boua was born in 1978 in Abidjan, Ivory Coast, where he continues to live and work. His work has been exhibited in 'Pangae II: New Art From Africa and Latin America' at the Saatchi Gallery, London.